As it does every year, Children’s Theater Workshop is seeking local children to play angels, wisemen, and other roles in the Live Nativity performed during the Spirit of Christmas in Oriental. 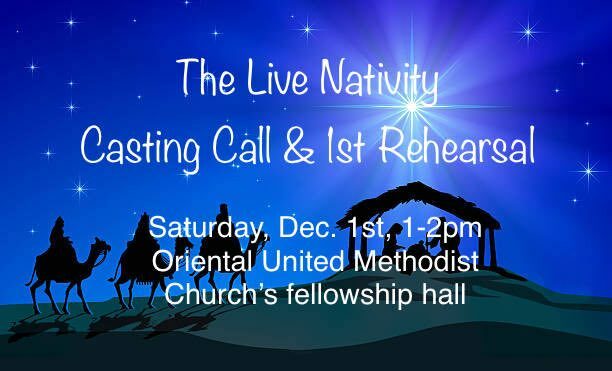 The casting call for this year’s Live Nativity is Saturday, December 1, from 1-2p at Oriental United Methodist Church. Can’t make it then? Call Yolanda Cristiani at 828-421-7981 or email the Children’s Theater Workshop at 1996ctw@gmail.com. The Live Nativity performance will be at 3:30p Saturday December 8 at OUMC.